NEW YORK, NY – (PR Newswire – June 16, 2015) – World renowned robotic prostate cancer surgeon, Dr. David B. Samadi, was awarded the Peter Latos Prostate Cancer Foundation Award last Thursday at the Foundation’s 2nd Annual Gala where he was honored in recognition of his faithful service for the treatment, prevention and innovation in the fight against prostate cancer. Dr. Samadi, Chairman of Urology and Chief of Robotic Surgery at Lenox Hill Hospital, was honored at the Peter Latos Prostate Cancer Foundation’s 2nd Annual Gala on June 11, at the Crest Hollow Country Club in Long Island. The event had over 500 attendees who came to show their support in memoriam of Peter Latos and help spread awareness in the fight against prostate cancer through early detection, research and prevention. 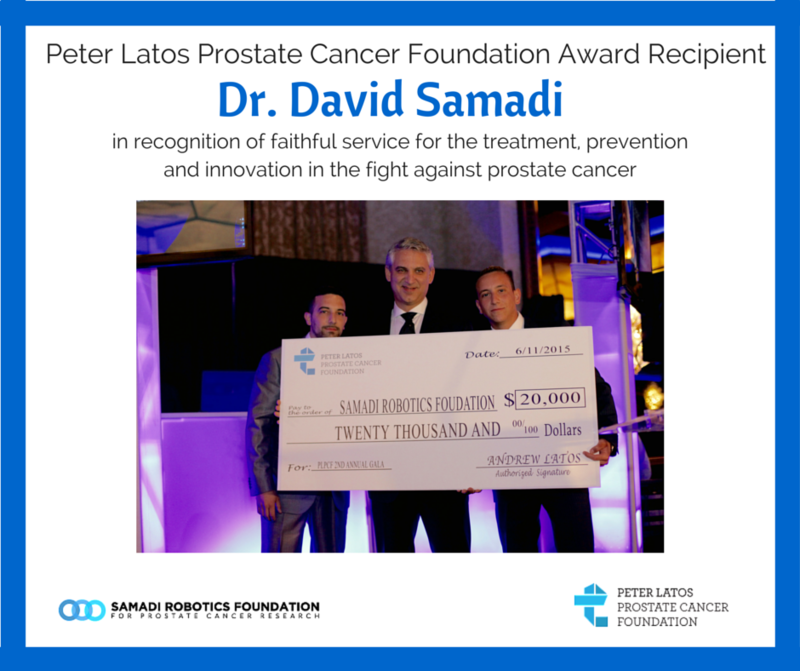 The Peter Latos Prostate Cancer Foundation also donated $20,000 to the Samadi Robotics Foundation, which is preventing, treating, and ultimately finding a cure for Prostate Cancer. The event was in honor of the late Peter Latos, who passed away from prostate cancer in May 2013 at the age of 48. Peter was diagnosed with aggressive prostate cancer in November 2009, when he was just 42. “Peter was very young and prostate cancer tends to be more aggressive in young men. His story should encourage all men to understand their individual risk factors like family history and to get a baseline PSA at the age of 40. Knowledge is power,” stressed Dr. Samadi. One of the main lessons from Peter’s story is how he was unaware of the PSA blood test screening. His regular physician had never ordered the test; it was only his cardiologist who suggested it. His first PSA was 23, (normal levels are between 1-4), and more testing led to an aggressive prostate cancer diagnosis. “My advice to males regarding Prostate Cancer is very simple…it’s called early detection. It’s very important that you ask your doctor if you are in your 40s or the second you turn 40 to have your PSA levels checked. If your doctor refuses or tells you you’re too young, then leave that doctor and seek another who would be willing to check your PSA,” advised Peter in a video recorded during his radiation treatment and the last years of his life. Peter came to Dr. Samadi after being diagnosed with an aggressive prostate cancer and worked to fight the disease through many treatment options including robotic prostate surgery to remove the prostate. Even prior to surgery, no tests or scans indicated the extensive nature of the cancer; it was only during surgery, that Dr. Samadi discovered the cancer has spread to the lymph nodes, proving even further how aggressive his cancer was. Only surgery can give an accurate staging of this cancer. “Peter’s story will live on and his message of ‘One simple blood test’ is and will continue to save the lives of men all over the world. Prostate cancer is a silent killer and we have to do more in educating both men and women about the PSA blood test for screening,” said Dr. Samadi. In spite of the guidelines, Dr. Samadi recommends men get a baseline PSA at the age of 40 and to know their risk factors. Peter actually discovered this cancer through a routine physical with his cardiologist, who suggested a PSA blood test, which the U.S. Preventive Services Task Force doesn’t recommend until men reach the age of 55. “Peter always said, ‘Check your PSA…it’s only one simple blood test.’ Men should take this very seriously. The early detection of prostate cancer is critical,” said Dr. Samadi. Patients newly diagnosed with Prostate Cancer can contact Dr. Samadi at the Lenox Hill Prostate Cancer Center for a consultation by visiting prostatecancer911.com and calling 212.365.5000.